Now that J.B Pritzker’s begun his term as governor over a State House that’s almost straight blue, he’s making legal recreational pot a priority. In a recent interview with the Chicago Sun-Times, Pritzker said he hopes Democrats put forth a legalization bill by the end of spring. Ten states allow recreational cannabis use. Even if Illinois becomes the eleventh, Loyola students should slow their rolls and think twice before toking on the East Quad. As a university that gets federal funding, Loyola is bound by federal laws. That means even if weed becomes legal in Illinois, an adult over the legal age could still get in trouble if they possess or smoke it on campus. Just look at some schools in Colorado, arguably the legal cannabis capital of the United States. Its universities have some surprisingly strict policies regarding pot use amongst students. Colorado College prohibits its students from using cannabis in all forms. That doesn’t just mean students could get in trouble if they’re caught with the dank stuff in their dorms; it also bans students from using it off university property entirely. 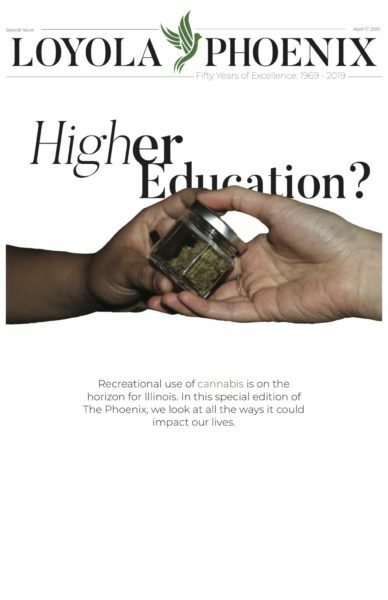 “As a student of Colorado College, your conduct, whether it takes place on-campus or off-campus, is subject to the Student Code of Conduct, including the prohibition on marijuana use,” the college’s frequently asked questions section on its website reads. The federal law that most restricts institutions from ascending to “higher” learning is the federal Drug-Free Schools and Communities Act, which in plain terms means schools must commit to fight illicit drug use if they want to receive federal funding. Cannabis is illegal under federal law. In Illinois, medicinal cannabis has been legal since 2014. But that didn’t change Loyola’s policy either. 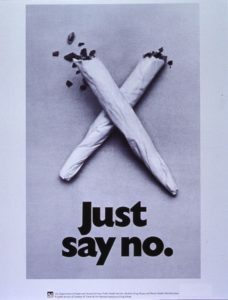 Employees such as university faculty and staff at Colorado College are also banned from using legal pot under the federal Drug-Free Workplace Act of 1988. Even if it’s out of the workplace, they can be punished if they use weed and their employers find out. Similar rules exist at other Colorado colleges and universities. Those rules also apply in the nine other legal states. Just because pot’s legal under a state law doesn’t mean universities wouldn’t and couldn’t punish students through their own conduct systems. That’s the answer The Phoenix got from Loyola, too. Loyola receives federal funds and needs to be federally compliant with drug laws if they want to keep receiving funds. That’s a buzzkill for Loyola students and employees alike. In 2016, Illinois decriminalized small possessions of cannabis. However, William Rodriguez, Loyola’s assistant vice president and dean of students, said this didn’t change anything in Loyola’s policy. “[Loyola’s cannabis policy] has not changed because federal law has remained the same,” Rodriguez said. Loyola’s current policy states that while the use of medical cannabis for some conditions is legitimate in Illinois, Loyola is required to comply with federal laws. Because the Controlled Substances Act remains an active federal law, Loyola must refrain from allowing the possession or use of cannabis on campus even if state and city laws allow it, according to Loyola’s Office of Student Conduct and Conflict Resolution (OSCCR). Loyola’s alcohol and drug policy coincides with federal, Illinois and Chicago laws regarding drugs and alcohol. The policy says the illegal possession of drugs and alcohol can be met with imprisonment, fines, community service and a permanent criminal record. Additional punishments include the confiscation of items of property connected with illegal drugs and the loss of federal student loans, grants and contracts. Loyola’s Campus Safety Department didn’t respond to a request for comment about past changes in protocol and the current protocol for cannabis use.